It's getting cold, and nothing is better than a cup of hot apple cider! My favorite secret ingredient is Williams-Sonoma Mulling Spices, but it's easy enough to make this on your own. Spiced Hot Apple Cider is one of my favorite things to serve at a holiday party because it makes the house smell AMAZING, and people absolutely love it. At my last Christmas party, I had 25-30 guests and went through about 6 gallons! Like I said, people really love it. Simmer apple cider. Put spices + peels in a large tea infuser or tie up in a cheese cloth. Add spices to the cider and bring to light boil. Bring to simmer for 5-10 minutes, then remove spices. Keep cider on low heat. Ladle cider into mugs and add rum to taste. 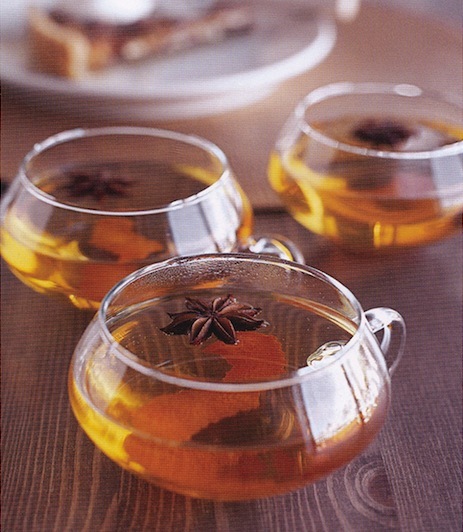 Garnish with one star anise or a cinnamon stick. *If you are making more than one gallon for a party, you can reuse the spices. I have these same mugs and they are part of my punch bowl serving. I got them as a wedding gift in 1976 but I have seen the same design recently. Maybe "google" punch bowls and see what you come up with.